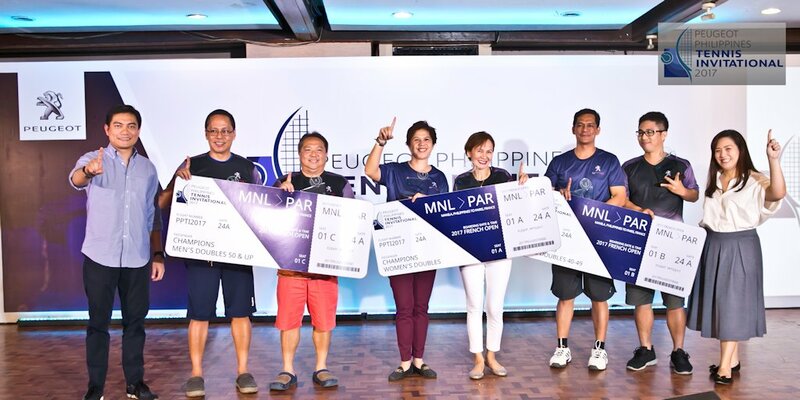 After 3 days of intense competition, the first champions of the 2017 Peugeot Philippines Tennis Invitational (PPTI) were awarded in a ceremony held at the Valle Verde Country Club. For winning the top spots in each division, the champions are given a trip to Paris, France to catch a live 2017 Roland Garros match. Speaking to the participants during the evening’s festivities, Peugeot Philippines President Glen Dasig echoed the importance of tennis to the brand. “Peugeot and tennis share a deep connection, which is why we are very passionate about it. This tournament is proof of our commitment to supporting such a strong tennis community here in the Philippines,” Dasig said. In 2015, Peugeot Philippines embraced the sport of tennis and committed to support it by successfully staging the Peugeot Philippines Tennis Open (PPTO). This year, Peugeot solidified their support by expanding the coverage of the tournament to target a different group of players, which include members of tennis clubs all over the country. This year’s invitational gathered 192 participants from various sports clubs and groups nationwide. The participants are then divided into three (3) divisions: Men’s Doubles 40-49 years old, Men’s Doubles 50 years old and above, and Women’s Doubles 40 years old and above. The road to the championships was dominated by Team Hillsborough-Lhuillier, who took both the Men’s 50, and Women’s 40 titles. In the championship match against crowd favorite Team Mandaluyong Tennis Club in the Men’s 50 Division, Jacinto “Jackie” Tomacruz III and Rolando Oliquino got away with a straight win in two sets, 6-1, 6-2. Both Tomacruz and Oliquino are avid tennis enthusiasts, having been playing together for more than 3 years. “I am really happy. Ecstatic in fact. We joined PPTI for the love of the sport and now we are going to see French Open live,” said Tomacruz when asked about their recent victory. It was a different story in the Women’s 40 Division where Michelle Mendoza and Ching Henson faced strong contender Team Valle Verde Country Club. Hillsborough-Lhuillier took the championship after a long, grueling match that ended in a gripping tiebreak: 6-7 (7-4), 6-4, 10-3. Both ladies were overwhelmed with their victory. “Winning the tournament is such a great feeling,” Henson exclaimed. Both are now looking forward to enjoying the sights and sounds of Paris, as well as seeing their tennis idols in the courts. In the Men’s 40 Division, Engr. Eddie Ventura and Atty. Jason Benitez from Team New Capitol Estate took the top prize from Team Mandaluyong Tennis Club in an exciting, fast-paced match. The winning team smashed their way into victory with a score of 6-2, 6-1. The win came as a surprise for both men as they weren’t really expecting to make into the finals. “I’m happy because even though I already stopped competing in tennis, we still won,” said Ventura. Atty. Benitez offered Engr. Ventura the invite to join the PPTI against all odds, he added. “I wasn’t really expecting us to reach the finals,” Atty. Benitez said. “I’m happy because we got lucky,” he added. In addition to witnessing the French Open, the champions will also get to tour Peugeot Avenue in Paris, the brand’s flagship lifestyle store. “The trip will also be a wonderful opportunity for our PPTI champions to experience and appreciate the Peugeot brand in its home country. With its wide selection of exclusive merchandise, Peugeot Avenue will surely be worth looking forward to,” Peugeot Philippines Business Development Director Dong Magsajo said. Aside from the champions, a very lucky pair also got the chance to fly to Paris. Manolo Fernandez and Naresh Ramnani of Team Valle Verde Country Club were picked to join the champions on the road to Roland Garros. “It was surreal. We weren’t expecting to win,” the pair said after winning the trip to Paris. Having never partnered until the start of the tournament, both participants are now looking forward to watch the French Open come June. 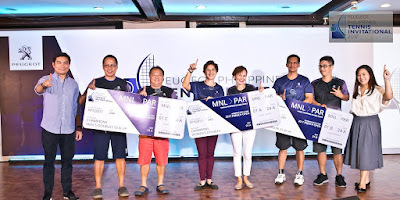 Peugeot Philippines President Glen Dasig surprised participants and guests during the awarding ceremonies after announcing that a second run of the Peugeot Philippines Tennis Invitational will happen in October 2017. “Due to the immense success of this tournament, Peugeot Philippines is staging another run of the invitational in October. Winners this time will get the chance to watch the Australian Open live in January 2018. Details will be announced soon in our social pages and our website,” Marketing Director Karen Carvajal said.